There's no doubt that robots do a great job with human tasks and even more. But when most people think of robots, they don't usually picture them as building human relationships. 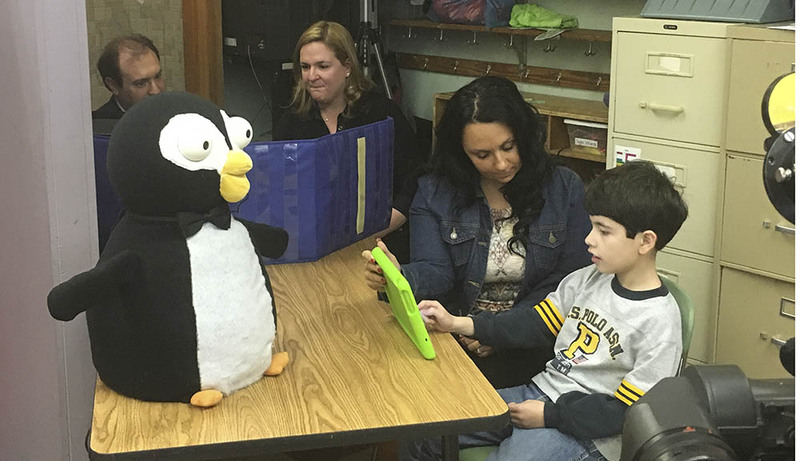 A new robot called PABI (Penguin for Autism Behavioral Intervention), is doing just that, and could actually change the way behavioral therapies are provided to children with autism. Gregory Fischer, Laurie Dickstein-Fischer, and PABI. Young children with autism typically have difficulty with social interaction and verbal and non-verbal communications. Early intervention, through Applied Behavioral Therapy, focuses on developing these skill areas and requires consistent, methodical one-on-one therapy. Therapists must often act like jugglers as they simultaneously interact with a child while organizing and presenting flash cards and other prompts, recording results of each interaction, assessing the child’s mood and adjusting the session accordingly, and gauging whether the child is ready to progress to the next skill. “PABI helps support therapists and enhances their impact on the child,” says Dickstein-Fischer. Under the penguin’s soft exterior is a computer connected to a wireless tablet, which runs interactive lessons for the student, such as identifying pictures. The computer collects data on the child’s responses and operates an internal camera to track a child’s gaze and facial expressions. With rote tasks such as recording interactions managed by the robot, the therapist can focus on the child. The researchers say they have observed more human interaction as the therapist moves closer to the student, engages him or her in facial gaze, and helps practice eye contact. “They are interacting much more and not feeling the pressure to fill out the data tracking forms or manage other therapy-related logistics during the session,” says Fischer. PABI is also immune to the fatigue or burnout that can sometime afflict humans. Whether a question is asked three times or 30, PABI's voice inflection remains consistent, neutral, and eternally patient, allowing the child to respond to those steady cues and not be influenced by any emotions from a therapist, parent, or teacher. PABI can also be used to help children get the often-recommended 40 hours per week of therapy. PABI serves as a supplement to schoolwork and can be used at home by parents or other caregivers. While many kids who require intensive therapy might see numerous different caregivers, incorporating PABI into the treatment plan helps provide consistency in the way therapy is delivered and results are tracked. PABI can also bridge the summer months when children typically might receive fewer hours of therapy and backslide in their progress, says Dickstein-Fischer. PABI is also giving families an affordable option for supplemental services. The organization Autism Speaks estimates that it takes around $60,000 a year to support a child with an Autism Spectrum Disorder. While a robot may be thought of as an expensive and technically intimidating tool, PABI is expected to be simple to operate and cost only a few thousand dollars. In designing teaching tools for autistic children, exacting elements come into play. The robot has to look cuddly and cute, but, to prevent distraction, it can't be too colorful. A penguin's black and white colors (with a pop of yellow in the feet and beak) work well. The robot also has to be safe and affordable. Being mindful of the sensory sensitivities children with autism sometimes have, PABI's covering is cozy and soft and has no sharp edges. And it has to be interactive, so the appealing way PABI flaps his wings when a child gives a correct answer offers gentle encouragement. This summer PABI was tested during an intensive two-week pilot study with five students at the Therapeutic Learning Center at the Beebe School in Melrose, Mass. With promising results, especially related to child engagement and teacher satisfaction, the researchers hope to move forward and recruit funding to help replicate PABI and begin production in order to get it into as many schools and centers as possible. The researchers plan to introduce other features, such as multiple language capabilities. They also think PABI could be useful in rural pediatricians' offices, where it can take months for families to get an appointment with a specialist who can help diagnose autism. While PABI cannot make a formal diagnosis, it can be a valuable tool to provide reliable information to contribute to a diagnosis and lead to help right away. “Early intervention is so critical,” says Dickstein-Fischer. Noting the encouraging feedback received at the end of the pilot study, Dickstein-Fischer says this first phase has been a huge leap in the next direction for PABI. “Hearing parents say that this makes such a difference for their child is so rewarding,” says Dickstein-Fischer. CBS Boston's Dr. Mallika Marshall also covered this story, saying PABI could make autism services "much more accessible...and affordable." Check out her story.